Which 40G QSFP+ Transceivers Can Be Used for 4x10G? Since the overwhelming growth in data traffic, many data centers are loaded with 10G and 40G based Ethernet switches for 10G to 40G migration. 40G switches allow the configuration of 40G port to act as one port or break out into four individual ports. To get easy 10G/40G migration, we should better select 40G QSFP+ transceivers which can break out as 4x10G connectivity. Among so many versions of 40G QSFP+ transceivers including QSFP-40G-SR4, QSFP-40-CSR4, QSFP-40G-LR4, QSFP-40G-ER4, etc., which 40G QSFP+ transceiver can be used for 4x10G? 40G short distance multimode transceivers are interfaced with 12-fibre MTP/MPO, such as 40G SR4, CSR4. To know why these 40G QSFP+ modules can be used for 4x10G, let’s see how QSFP-40G-SR4 work? First, 4 electrical input signals of 10G converted into parallel optical signals are sent from the transmitter over 4 parallel fibre strands. Then the parallel optical signals are converted into parallel electrical signals by the use of a photo detector array and transmitted to the receiver over another 4 parallel fibre strands. QSFP-40G-SR4 needs 8 fibres to transmit and receive signals. QSFP-40G-SR4 transceivers are interfaced with 12-fibre MTP/MPO. Therefore, QSFP-40G-SR4 and QSFP-40G-CSR4 transceivers can be easily broken down to 4x10G connections. Each 10G signal lane of QSFP-40G-SR4 is compliant to IEEE 10GBASE-SR specifications. And this 10G/40G connection can be achieved by using an MTP-LC harness cable or MTP cable and MTP-LC breakout patch panel to connect the QSFP-40G-SR4 and four 10GBASE-SR modules. Can QSFP-40G-LR4/ER4 Be Used for 4x10G? QSFP-40G-LR4 transceivers apply CWDM (Coarse Wavelength Division Multiplexing) technology. From the transmitter side, 4 input electrical signals of 10G are converted into 4 CWDM optical signals by a driven 4-wavelength distributed feedback (DFB) laser array. Then 4 CWDM signals are multiplexed to a singlemode fibre for 40G optical signal transmission. On the receiver side, the receiver accepts 40G CWDM optical signals input and demultiplexes them into 4 individual 10G optical data streams with different wavelengths. Multiplexing and demultiplexing of the four wavelengths are managed in the device. The 40 Gigabit Ethernet signal is carried over four wavelengths on a pair of singlemode fibres. The duplex fibres are used for bi-directional transmission. QSFP-40G-LR4 and QSFP-40G-ER4 are interfaced with duplex LC connector. Therefore, we can’t split QSFP-40G-LR4 or QSFP-40G-ER4 to 4 individual duplex SMF fibres to route them to 4 separate 10G transceivers by simple optical rerouting. But if you insist to split the 40G into four 10G streams using QSFP-40G-LR4 or QSFP-40G-ER4 modules, how to achieve that connection? Then you need a simple multiplexer/demultiplexer which split the four wavelengths on duplex fibres into 4x10G signal in four different fibres. With such equipment, the QSFP-40G-LR4 or QSFP-40G-ER4 outputs can be physically broken down from one duplex fibre into four duplex fibres so that each of the wavelengths is transmitted in four different fibres (As the following figure shows). From the above content, you may get an inclusion that multimode 40G QSFP+ transceivers can be directly used as 4x10G while singlemode 40G QSFP+ transceivers can’t. However, you ignore one singlemode transceiver QSFP-40G-PLRL4. This 40G QSFP+ transceiver connects with 12-fibre MTP/MPO patch cable though it’s designed for long distance transmission. Similar to QSFP-40G-SR4, QSFP-40G-PLRL4 also needs 8 fibres to transmit and receive signals. So you can easily get 10G/40G singlemode connection applying QSFP-40G-PLRL4. Some data centres may face the issue of migration from 10G to 40G. 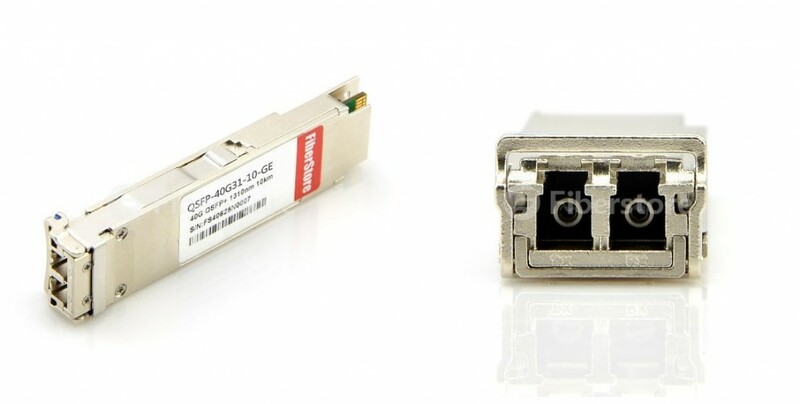 Except the switch, you also need to know 40G QSFP+ transceivers well especially what kind of 40G QSFP+ transceivers can be used for 4x10G connectivity. In this article, you can see 40G QSFP+ transceivers with MTP/MPO interface can achieve that connection by simple optical routing. As to 40G QSFP+ transceivers with duplex LC interface, you need spare equipment for multiplexing/demultiplexing. For 40G to 4x10G solutions, you can find your desired one from FS.COM. Related article: How to Extend 40G Connection up to 80 km? How to Select Fibre Patch Cable for 40G QSFP+ Modules? This entry was posted in Fiber Optic Transceivers and tagged 40G QSFP+ transceivers, QSFP-40-CSR4, QSFP-40G-ER4, QSFP-40G-LR4, QSFP-40G-SR4 on May 4, 2017 by laura. 10Gbps data rate can’t meet the high-speed needs. So people start to develop 40Gbps solutions. As a result, a variety of 40G QSFP+ transceivers can be found in the market, like QSFP-40G-SR4, QSFP-40G-CSR4, QSFP-40GE-LR4, QSFP-40G-LX4, etc. Different transceivers offer different ways to migrate from 10G to 40G. Among these solutions, which one is the most cost-effective? The answer is QSFP-40G-LX4. This following test will tell about QSFP-40G-LX4 in details. Juniper networks JNP-QSFP-40G-LX4 transceiver applies the new 40 Gigabit Ethernet technology — LX4 offered by Juniper. This transceiver module uses the same infrastructure as 10 GbE. The LX4 technology can meet all the performance criteria of today’s data centre in which two multimode fibre strands and duplex LC connectors are used for 40GbE connectivity just like existing 10GbE infrastructure. As the above mentioned, QSFP-40G-LX4 transceiver provides the ability to transmit full-duplex 40Gbps data traffic over one duplex multimode fibre cable with LC connectors. In other words, this transceiver delivers 40 Gbps over duplex OM3 or OM4. It can achieve the direct connection from 10 Gbps to 40 Gbps through LC duplex fibre cable. The QSFP-40G-LX4 has four 10Gbps channels. Each channel can transmit and receive simultaneously on four wavelengths over a multimode strand (see the following figure). Thus, the 40Gbps link can be connected by two multimode strands. QSFP-40G-LX4 connections can support the data transmission distance up to 100 metres over OM3 and 150 metres over OM4. When preparing to migrate from 10G to 40G network, cost is one of the most important thing to be considered. As we know, existing 10Gbps connections commonly use MMF cables with LC connectors. While most 40Gbps connections often need eight fibre strands, each four parallel strands for transmitting and receiving respectively. Take QSFP-40G-SR4 an example, it uses 12-fibre MPO cable. Under that condition, 10Gbps cabling infrastructure should be upgraded to migrate to 40Gbps. It will cause additional cost of new patch cables, new patch panels, and expansion of the current fibre trunk. However, QSFP LX4 transceiver can solve the cost issue. With QSFP-40G-LX4, it’s much easier to migrate from 10G to 40G network without considering the problem of deploying new cabling infrastructure or buying migration cassettes. Instead, it only needs to replace the 10GbE optical module with 40G-LX4. Because QSFP+ LX4 uses LC connectors. It allows the same cables to be used for direct 10 Gbps connections to direct 40 Gbps connections, resulting in zero-cost cabling migration. No additional spending on cabling will be required if QSFP+ LX4 transceivers are used for all 40 Gbps links. As a result, users realize 100 percent investment protection of their existing infrastructure and incur no additional cabling costs. This is a significant advantage when compared to the cost of reconstructing the cabling system using QSFP SR4 transceivers. If the cabling for this network is an expansion to the existing cabling system, the 40 Gbps connections can be built using MMF cables and QSFP SR4 transceivers or QSFP+ LX4 transceivers. QSFP+ LX4 can save a lot for 40 Gbps migration. There are many solutions for the migration from 10G to 40G. QSFP+ LX4 technology removes 40 Gbps cabling cost barriers for migrating from 10 to 40 Gbps in data centre networks. QSFP+ LX4 transceivers provide 40 Gbps connectivity with huge cost savings and simplicity for next-generation data centre 40GbE deployments. The QSFP+ LX4 transceiver allows organizations to migrate their existing 10 Gbps infrastructure to 40 Gbps at zero cost of fibre, and to expand the infrastructure with low capital investment. FS.COM provides JNP-QSFP-40G-LX4 transceivers with high quality and 100% compatibility. All of transceivers have gone through test-assured program before reaching customers. This entry was posted in Fiber Optic Transceivers and tagged Juniper QSFP+ LX4, QSFP-40G-LR4, QSFP-40G-SR4, QSFP+ on June 10, 2016 by laura. Do You Know about QSFP LR4 PSM? 40GBASE QSFP+ (Quad Small Form-Factor Pluggable) transceivers are widely provided all round the world. These modules offer various high-density and low-power 40 Gigabit Ethernet connectivity options for data centre, high performance computing networks, enterprise core and distribution layers and service provider applications. Among so many options, such as QSFP-40G-SR4, QSFP-40G-LR4, QSFP-40G-ER4, WSP-Q40GLR4L, etc., QSFP-40G-LR4 is well know as it can support link lengths of up to 10 km over single mode fibre. It enables high-bandwidth 40G optical links over 12-fibre parallel fibre terminated with MPO/MTP multifibre female connectors. The following will talk about one of QSFP-40G-LR4: QSFP LR4 PSM (Parallel Single Mode). This QSFP LR4 PSM is a parallel single mode optical transceiver with an MTP/MPO fibre ribbon connector. This transceiver module offers 4 transmit and 4 receive channels and each can support 10.3125 Gbps data rates (as shown in the following figure). The transmitter accepts electrical input signals compatible with Common Mode Logic (CML) levels. All input data signals are differential and internally terminated. The receiver converts the input signals via a photo detector array into parallel electrical output signals. And the outputs signals are also voltage compatible with Common Mode Logic (CML) levels. All signals are differential and support a data rates up to 10.3 Gbps per channel. Each module offers 7 low speed hardware control pins (including the 2-wire serial interface): ModSelL (Module Select), SCL (Serial Clock), SDA (Serial Data), LPMode (Low Power Mode), IntL (Interrupt), ResetL, and ModPrsL (Module Present). Here just introduces several pins. ModSelL is an input pin. When held low by the host, the module responds to 2-wire serial communication commands. The ModSelL allows the use of multiple QSFP+ modules on a single 2-wire interface bus–individual ModSelL lines for each QSFP+ module must be used. SCL and SDA are required for the 2-wire serial bus communication interface and enable the host to access the QSFP+ memory map. LPMode pin is used to set the maximum power consumption to protect the host. If the hosts are able to cool higher power modules, such modules will be accidentally inserted. FS.COM QSFP-40G-LR4 is designed for use in 40 Gigabit Ethernet links over single mode fibre. It’s compliant with QSFP+ MSA and IEEE 802.3ba 40GBASE-LR4. 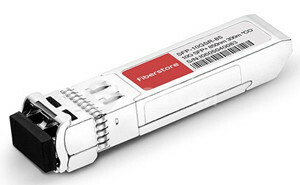 LR4 PSM is one of QSFP-40G-LR4 modules. All these cost-effective transceivers have to be tested before shipping to ensure full compatibility and to offer the best customer service. This entry was posted in Fiber Optic Transceivers and tagged QSFP-40G-LR4, WSP-Q40GLR4L on March 4, 2016 by laura.